Lenz is proud to host many interns that leave behind legacies of hard work, creative ideas, and lasting relationships. It should come as no surprise that our 2017 summer intern Allison Miller would combine her social media savvy and natural design talent to leave us with an especially unique legacy: a Snapchat geofilter. For the 158 million people who use Snapchat every day, one of the most popular features are the geofilters—creative overlays based on location and time that appear around the user’s picture or video. 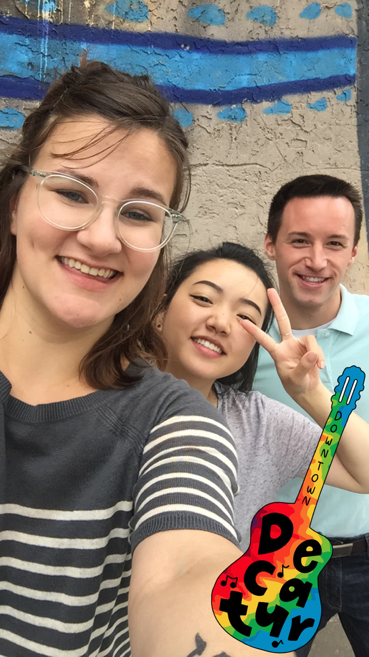 During Allison’s summer internship with Lenz, she noticed the area around the Lenz office in downtown Decatur was lacking a geofilter option that truly expressed the colorful and creative atmosphere of the community. So, she decided to do something about it by designing and submitting her own geofilter for the downtown Decatur Square. As a part of the application process, Allison detailed the rich, cultural history of the Decatur area as her creative inspiration. Be on the lookout for this Allison’s Snapchat geofilter next time you’re taking a selfie on the Decatur Square! 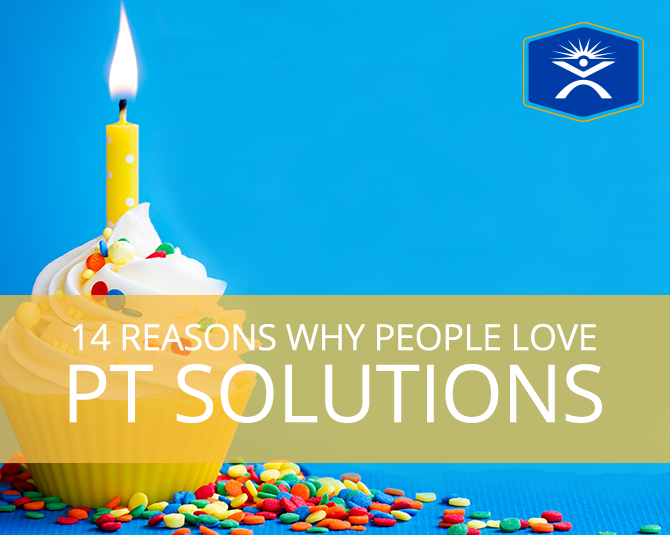 Our friends at PT Solutions Physical Therapy recently celebrated their 14th birthday! 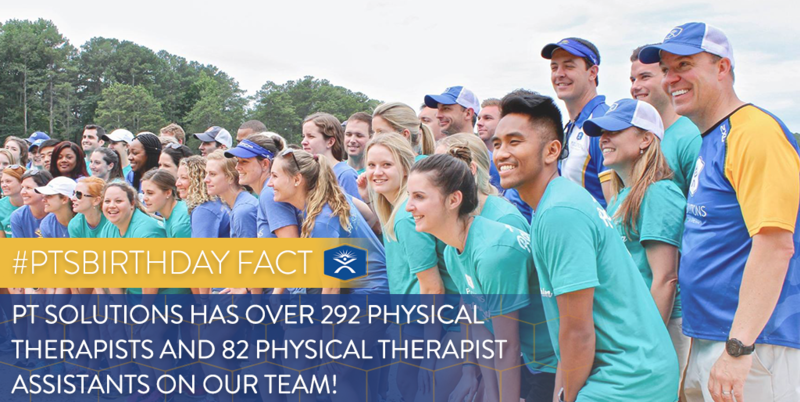 In those 14 years, this physical therapy practice has grown from one clinic in Eufaula, Alabama to 120 across 12 different states. 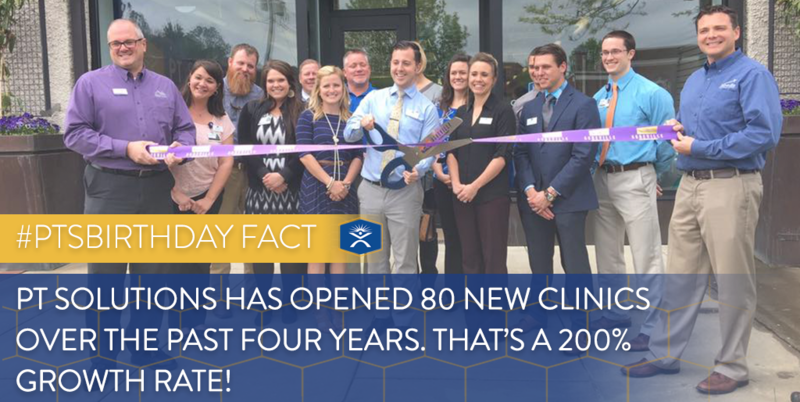 Team Lenz helped celebrate this growth and success the best way we know how: awesome digital content. Take a look at the videos, graphics, and copy we crafted to commemorate this occasion below. When you’re done, also check out the blog we wrote that celebrates 14 wonderful years in business. Here’s to many more! As a lifelong Elvis fan, I’ve been curling my lip and swiveling my hip to the king’s music for as long as I can remember. 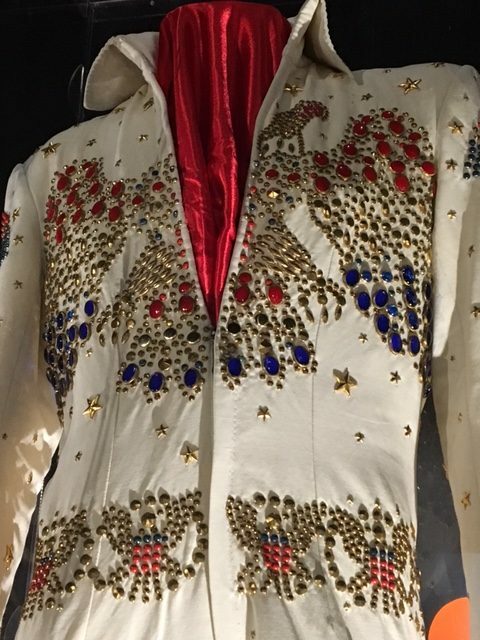 Several years ago, when Elvis Presley Enterprises first asked me to blog for Elvis Week –the annual gathering of Elvis fans from all over the globe at Graceland, Elvis’ former home in Memphis, Tenn.– I was all shook up, to say the least. The Elvis Week blogging gig basically means I’m the eyes and ears of fellow fans for the duration of the royal, rocking festivities. Elvis’ musical collaborators, movie co-stars, friends, family members, and others participate in live Q&A sessions, concerts, and more. 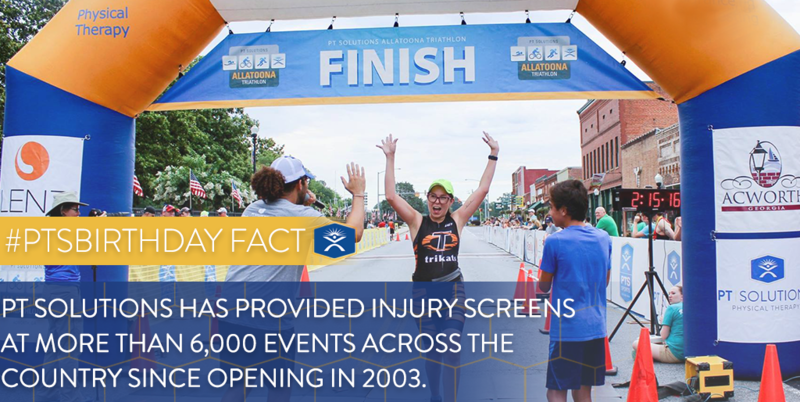 And the special events run the gamut from an Elvis Presley 5K to a sold-out Elvis dance party. This year proved to be the longest and arguably largest Elvis Week in history. 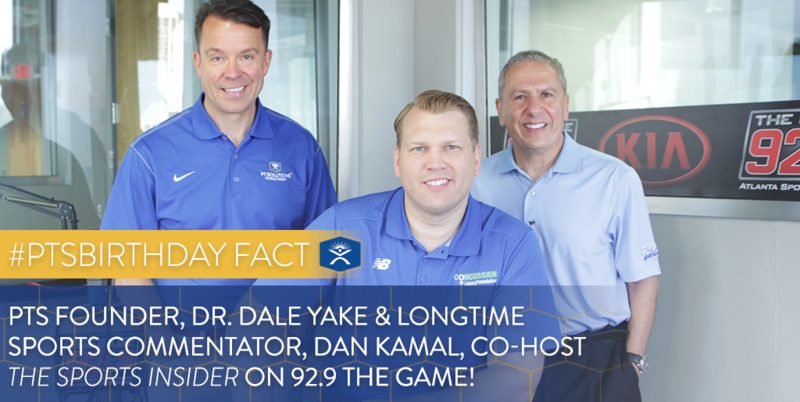 Although official numbers haven’t been released, I’m guessing somewhere near 80,000 unique visitors attended across those nine days. On August 15 alone, the eve of the anniversary of Elvis’ death, approximately 55,000 fans lined Elvis Presley Boulevard in front of the Graceland mansion for the Candlelight Vigil. This annual procession of fans up the estate’s driveway to Elvis’ gravesite in the backyard lasted into the next morning. The devoted respectfully took turns taking the trek, candles in hand. Extraordinary, singular, and awe inspiring. While covering happenings such as the Candlelight Vigil, time management continues to be the biggest challenge of Elvis Week blogging. After hoofing it in my blue suede shoes from one event to the next, day turns to night. And then I have a blog to write. Yet, despite the rigors of the gig, it’s unbelievably fun and a dream job for an Elvis nut such as I. Curious? You can check out my blogs here:Day 1, Day 2, Day 3, Day 4, Day 5, Day 6, Day 7, Day 8 and my Day 9 Wrap-Up. The last blog details 10 of my favorite aspects of Elvis Week 2017. Below I’ve added a few of my favorite portions of the trip. 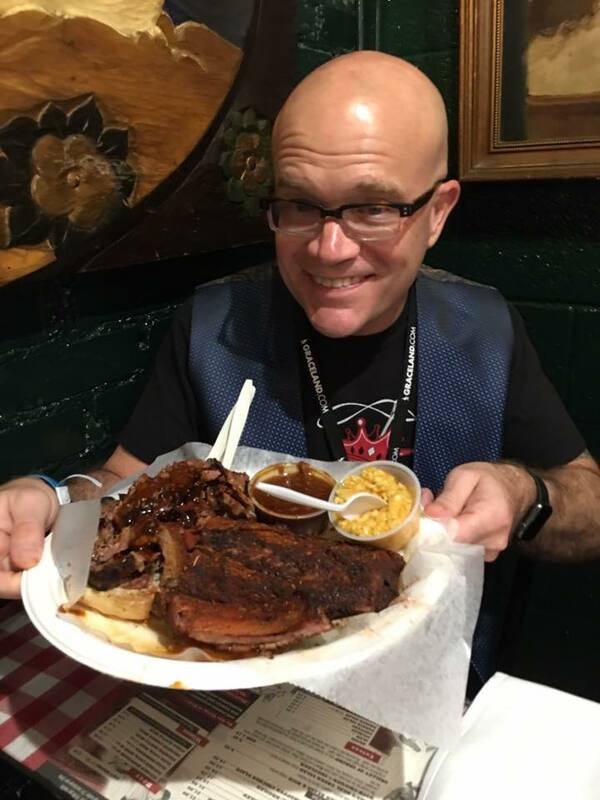 Maximum caloric intake always accompanies my Elvis Week excursions, and Memphians perpetually debate over the best barbecue in town. Like many repeat visitors, I have my favorites. A trip to Cozy Corner for a barbecued Cornish hen remains mandatory. Marlowe’s, just down Elvis Presley Boulevard from Graceland, often gets overlooked, but always delivers. Before the big 40th anniversary celebration concert at the Fed Ex Forum, I gorged at Charlie Vergos Rendezvous. The dry rub on the ribs never fails to delight. For me, credit card fatigue during Elvis Week is real. The gift shops at Elvis Presley’s Memphis, the new 40-acre complex just across the street from Graceland, overflows with kingly merch that begs to jump into my shopping bag. And I always love shopping from the same clothier Elvis did. 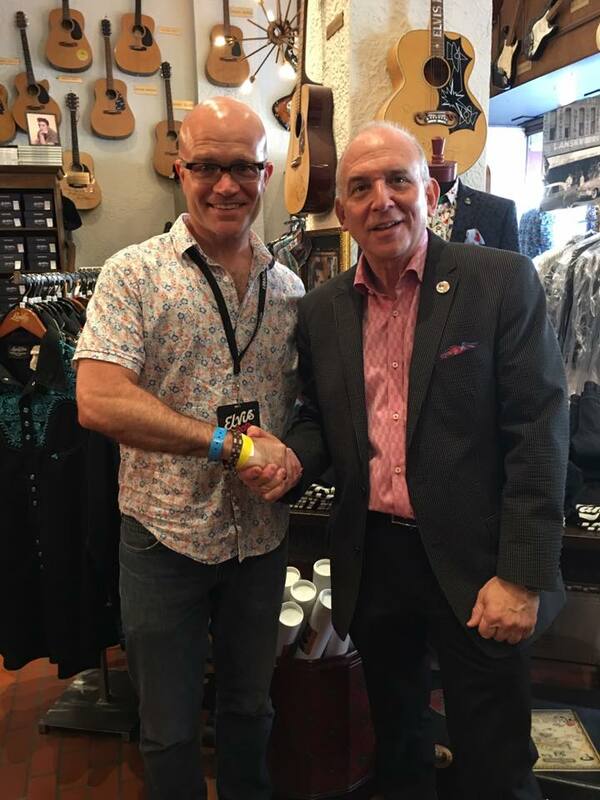 Lansky Bros., located in the lobby of the iconic Peabody Hotel, boasts the kind of fashion that first attracted a pre-fame Presley at its original location on Beale Street. I stopped in to pay a visit to my friend Hal Lansky, whose dad Bernard dressed Elvis himselvis. After outfitting me to the nines, Hal relayed one of his many Elvis tales. The tangible spirit of Elvis Presley during Elvis Week runs thicker than mushed up peanut butter and banana. I find it living in the fans I meet from around the world; the Elvis tribute artists who carry the torch; and at the Graceland mansion and in the adjacent museums. 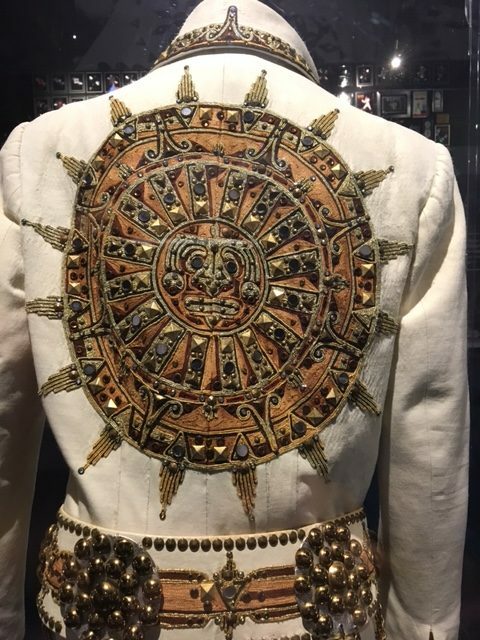 The latter, found at Elvis Presley’s Memphis, features up-close-and-personal access to Presley memorabilia. 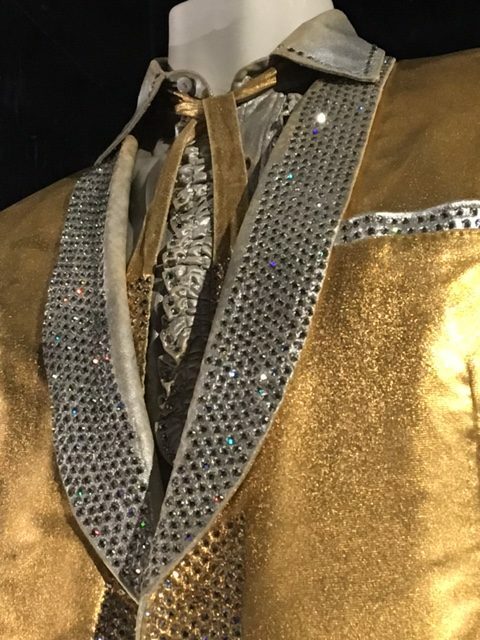 The king knew his bling, and here are a few of the pics I snapped of his stage duds.